This part of Tuscany is full of little medieval villages perched on top of hills. If we wanted to see all of them we’d never get to Siena in a month! So we take pot-luck and stop at Montegiovi. We park Emma just off the bypass and take the bicycles to zoom down the hill through the olive groves and back up the other side to the village. We come past a garden full of sculptures and are just about to stop and talk to the sculptor when we are put off by a couple fighting: an Italian woman shouts from a window in English to her British husband, who retorts with equal venom, and a three year old child on a trampoline is caught in the middle, looking slightly bewildered and lost. As we move on, I reflect on the nature of disagreements. Although there were plenty of disagreements between my parents, I was never subjected to a scene like this in my childhood. Somehow the dissonances between my parents were of a nature I could understand. I had a mother for whom truth and openness were very important and a father for whom, although an honest person too, harmony and peace were ultimately more important than The Truth, so he would look for what he had in common with people, and turn away from what separated him from them. At times, these two approaches were incompatible and led to friction and frustration (mostly on my mother’s part), and this was clear to me from an early age. Curiously enough, I feel I have inherited both my parent’s qualities, so in a way they are not incompatible. I think the linking ingredients are compassion and empathy. We stroll up the cobbled roads of Montegiovi. The houses look reasonably well kept, but there is an air of despondency about the place. Ok, it is Sunday lunch time, but everything looks completely dead and there are no shops in the centre of the village. 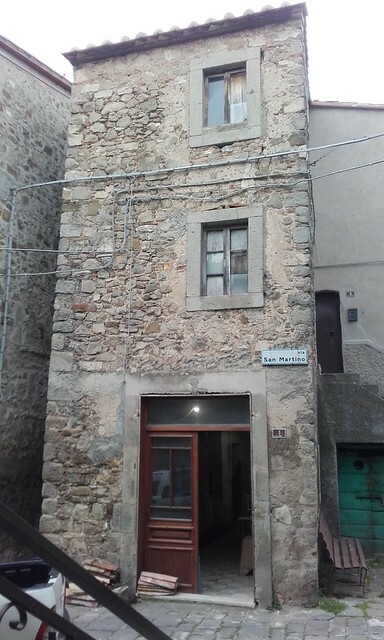 Coming up towards the church, there is an open door and we hear some noises, so we pop our heads in to find a young man in the process of restoring an old and narrow house. This used to be his Grandparent’s bar, he says, and he wants to restore it and reopen it as a bar and social centre. 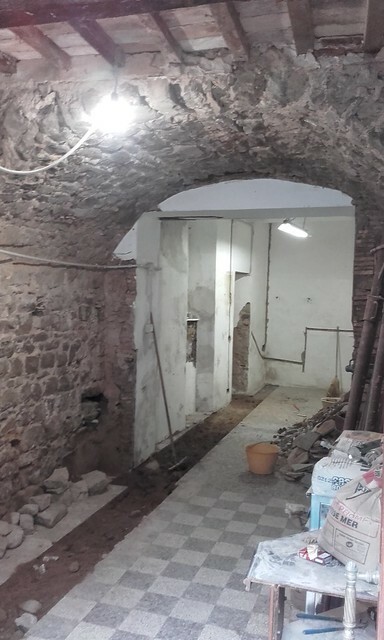 In painstaking weekend labour, he pulls away all the plasterwork to find beautiful stone arches and chestnut beams holding up the terracotta tiles of the second floor. He gives us a tour of the house, showing us where he’s discovered hidden rooms and high ceilings that were obscured by plaster board. The second floor has old baskets and large wine and olive bottles everywhere – this is where Dario plans a meeting point for young and old. His grandfather was a basket weaver and Dario’s plan is to keep some of the old tools and baskets to hang in the rooms. It is great to see the love for his village shining out of Dario’s eyes and his enthusiasm and tenacity to make a change. But when he speaks of the hardship they face to bring this village back to life, his desperation and sense of having been abandoned by the government comes through. A conversation with an older man on our way back to Emma corroborates this feeling. The will of the locals is there, but the hurdles they have to face with regards to legislation and the load they have to bear in terms of taxes is prohibitive. It simply is not worth producing olive oil or wine anymore, for example – by the time all the middle men have been paid, there is only just enough left to pay the taxes. The young Italian workforce leaves the countryside and is replaced by immigrants from Northern Africa. They still have hope for their village, but it hangs on a thread. It’s a sunny late morning when we roll off the boat in Civitavecchia. Spring has definitely arrived! Sergio from Passompomo gave us as a leaving present a beautiful slab of volcanic stone for barbequeing meat and veg on. Today is the day we want to christen it, so we stop off in Tarquina to buy some fish and then drive on to find a quiet place in the Tuscan hills for a barbeque feast. We have the fish and grilled fennel and some potato mash with fresh mint and all tastes delicious, especially the grilled things. Thank you, Sergio! Frank needs to find a place where he can watch the Rugby the next day, so we drop in on a hotel in Manciano – Hotel Rossi, a very friendly and helpful family-run hotel – where they allow us to use the internet and offer themselves as a back-up in case we don’t find a place that shows the rugby. After 10 minutes conversation with both mother and son, they heartily say good-bye as if we’ve been life-long friends, plus the mother says ‘if you ever need anything, you know where to find us’. This has happened to us several times on our journey: people have given us their contact details and emphatically said that if we are in trouble and need to ring a friend, we should call them. The Italians are very friendly people and I should be used to it by now, nevertheless, such genuine and open-hearted offers still overwhelm me each time I hear them. Frank has another meal the next day (while he’s watching Rugby late into the evening when I’m asleep), which includes a delicious anti-pasta, some ingredients of which he doesn’t recognise. We ask the next day and it turns out to be Bacalao! Stefano is very happy for us to stay parked up by his restaurant, so we have a day of catching up on admin and the blog before heading for an evening dip in the hot springs. It is such a pleasure to be outside sitting in hot water, and I don’t even mind the sulphurous smell. It is busier than it was in November but there is plenty of space, and it’s lovely to see whole families enjoying themselves. 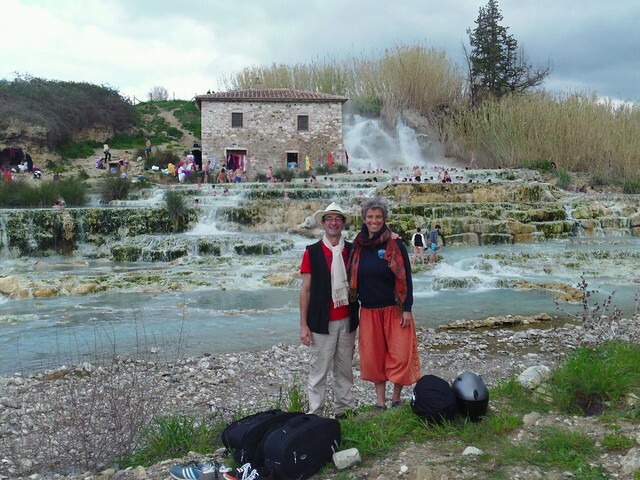 The next day, we say good-bye to Stefano, pass by the hot springs for another dip and then set off in the direction of Montalcino. If anyone would like to visit Stefano’s Restaurant, here it is on Trip Advisor. They also do accommodation and it’s not far from the hot springs – only about 4km. The time has come to say good-bye to all the wonderful people we met in Passopomo. Unbeknown to us, they have planned a get-together in honour of our departure, so on the night before we leave, everyone appears and food and laughter is shared one last time. We have thought of one word for each person that sums up what we feel they have inspired in us and we hand out a card to each of them with that word written in Frank’s decorative calligraphy. They are such a bunch of warm-hearted, lovely people and we leave enriched by new insights, new friendships and plenty of shared experiences. As a parting gift, we pick up any rubbish we can lay our hands on – by the end we have half a dozen rubble sacks and a few boxes. We say good-bye to Frank and Ruth (the goats) and we’re off, down the drive that Frank (the man) has spent the last two days removing overhanging branches from, in anticipation of our possible return in the autumn. On our way to Cassibile, we drop in on a tyre garage as we thought one of our tyres looked a bit flat. It turns out that that one is ok, but the one behind it is completely empty, due to a faulty valve! It doesn’t bear thinking about what would happen if we lost control of Emma on the motorway… We feel very lucky that nothing bad happened. In fact, it feels like another life has been given to us! After the repair, expertly done by a lovely smiling man from Enna, we drive on to our favourite beach in Fontane Bianche and spend a day in Quiet, just the two of us, Emma and the sea, celebrating a new start. At one point, a hefty thunderstorm drums on our roof, washing away all the volcanic dust we have accumulated over the past three months. In the evening, the sun comes back out and we go for a dip in the sea, completing the cleansing process. The following day, we head off up the hill to Luca and Laura’s place. Their neighbour, Salvatore, had already warned us via email of inclement weather and invited us to come and park outside his house instead of driving into a field that we might not get back out of. When we arrive, he comes to meet us at the bottom of his drive, at the ready with a chain saw to cut off any branches that might be in the way of Emma. We slowly inch up the drive, squeezing past old olive trees, oaks, protruding bits of wall, and often there’s only a centimetre on each side, but we make it up there. On a previous visit to Piano Cuni ( the name of this area near the Cavagrande di Cassibile), we had found out that one of Salvo’s passions is Tango dancing, so straight away on the first day, we haul the dance floor out from under the bed and lay it in his garage. Frank helps Salvo with some work digging trenches and laying pipes. I start removing rubbish from his yard, knowing that the wife he’s looking for will not arrive if his yard looks like a scrap heap. I spend a couple of hours picking up broken glass etc. After a while, Frank joins me and together, we spend the best part of three days cleaning the place! What is it about rubbish that attracts us so much? Anyway, half way through, we make one trip in Salvo’s car with about 6 bags of rubbish and various boxes of glass, plus when we leave we pile another 14 large bags into Emma to take to the public skips, and we leave a spanking, shining yard for him to enjoy. This was the cleaning action to top all others. We make a pact with Salvo that if within the next month, he meets the woman he is to marry, it is obviously as a result of cleaning the yard, in which case he must invite us to the wedding! We have lots of interesting, deep conversations, some of them quite heated, about politics, about refugees, about whether one has a right or simply the possibility to have children, about genetic manipulation of progeny, about the impact of religion on war and peace, about joys and sorrows in our families, about the nature of truth – and all in Italian!!! It is very challenging to follow Salvo’s talk, he’s a lawyer and a sharp thinker who expresses himself well with not necessarily the easiest words, making not many allowances for the fact that we are foreigners, especially when the topic is grabbing him. We hang in there, trying to follow the fast flow of words and searching to meet the vulnerable soul behind the words. Conversations ramble on in our minds long past our bedtime and wake us up in the night. We spend five beautiful days together, allowing ourselves to open up to each other through the mind, through communication, really connecting deeply – and interspersing this depth with hours of shared physical labour, with shared meals and with dancing, with strolls into the countryside to view his property. 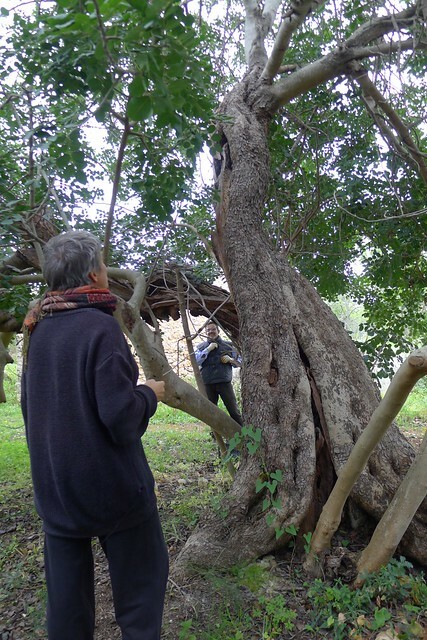 On one of these strolls, we come past the Carob tree that Salvo says is his family’s tree. For generations it has provided shade for every family member to stop their work, gather and have lunch in the heat of the day. Looking at the trunk, split and rotted three ways, one wouldn’t think the tree is still alive, but it’s branches are very much alive and growing. For Salvo, this tree is an important symbol of his family. We had intended to spend a couple of days seeing the north of Sicily but we abandon this in favour of staying with Salvo, finishing the cleaning of his yard and repairing the stove pipe of our wood burner. Frank finds some Almond seedlings in a heap of almond husks in the yard, which he carefully plants in pots. Salvo is very happy and says he will look after them and plant them in a special place, near each other and will call them Frank and Ruth. On Wednesday, it is really time to go – our ferry is leaving on Thursday and we don’t want to do the whole stretch in one day. We pass by Luca to say good-bye (and unfortunately miss saying a proper good-bye to Laura who by then had gone back to work in Catania). We’ve slightly neglected Luca in the last days, due to immersing ourselves at Salvo’s, but he says that was just fine, he’d had a lot of things to do and would not have had much time for us anyway. He hopes we will come back and to stay in touch. As we pootle along the narrow, straight, rocky road past the olive groves, we feel a gratitude for all the wonderful experiences we have had in this valley, from horse-riding to deeply connecting with nature and people. This really is a very special place, and we have met people who are well aware of it and have chosen to be conscientious guardians of it, living and working on the land. Our last stop before embarking on the Majestic is a trip to Cefalu, described as one of the most attractive towns in Sicily. And indeed it is a very sweet place and we spend a couple of hours strolling around the narrow cobbled streets, visiting the duomo and checking our emails in a wine bar run by Pascal, a local who has travelled the world. He spent 15 years in Paris and speaks fluent French, after which life took him to Germany where he fell in love with the German way of doing things, especially the work ethic. Health issues drove him back to Sicily but he is yearning to go back to Stuttgart and continue his German life. It’s nice to hear someone speak so positively of my native country. After some trouble with finding the harbour (we could see the boat alright – it towers over the town, like a little town in itself – but we couldn’t find the entrance to the harbour), we are one of the last vehicles to drive on. When booking the ticket, I’d decided to splash out and pay the extra to leave Sicily in a style befitting our journey: We have a ‘Matrimonial Suite’, right in the front of the boat and with a big window, facing the waves coming towards us. We are tired from the journey – before the boat is even out of the harbour, we’re both sound asleep. The next morning we wake up to find Italy’s coast fast approaching. 17th Home Alone 2 ! Once again Rosi kindly lends us her car so that I can drop Ruth off at Catania airport and on my way back to Passopomo I go shopping at a huge Auchan, mainly to buy foodstuff for Giulia´s Birthday Party the next day. 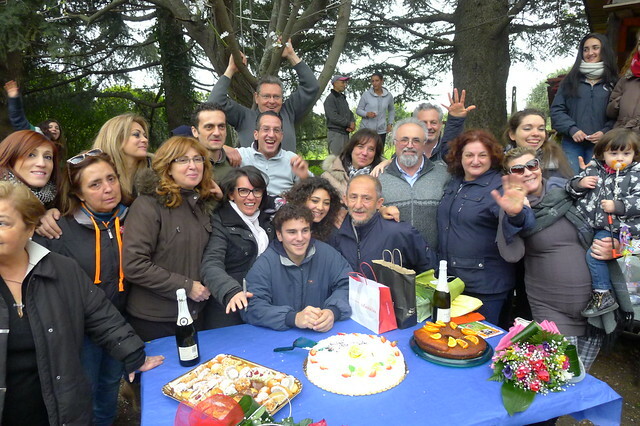 Rosi´s daughter is celebrating her 17th and what a year she´s had! She goes to school in Catania, where until his recent death, she was the main carer for her paternal Grandfather. She lives with her Gran, who she also cares for and is, amongst other things, a passionate Tango dancer. Her Mum also has the bug and at the week-end, the busiest time at the Maneggio, Rosi often gets home way after 2am and is still up and mucking out/feeding over 20 horses by 7.30am – on her own – what stamina! But also, what pressure she puts her body under, particularly her lungs – the feed comes in huge round bales which she unravels with a pitch-fork, creating clouds of ´dust´ in the process: not surprisingly she continuously struggles with a bad chest. If ever a situation cried out for the riding-stable equivalent of a team of ‘woofers’ Passopomo is it……. 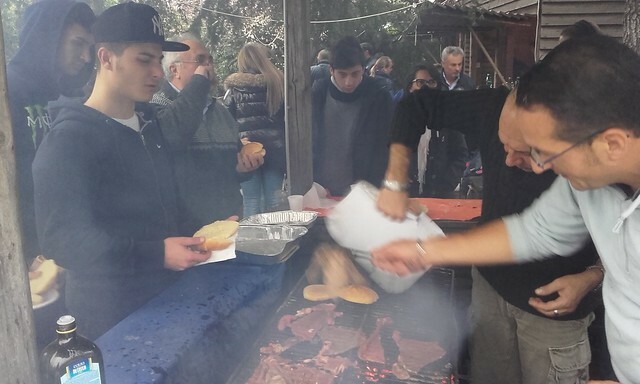 toasting halved bread-rolls for bruschettas, grilling endless spirals of Sicilian sausages, deliciously thin steaks and slices of peppered cheese, a complete round of which Luca, Giulia’s father, has brought from his neighbour’s farm in the hills above Cassibile. There are also trays of pasta and salads, all washed down with a strong local wine – which comes in no-nonsense 1.5 litre plastic bottles! All this is followed by 2 birthday cakes and a very touching present-opening/photo session befitting a wedding. I get a huge hug for the CD of the Tango Quartet who played at one of the Catania milongas all 4 of us went to, plus an invitation to be a helper at this Summer’s ‘Tango Mango’ in Totnes. She’s already had one offer to spend time at a riding-stable in Ireland and another in Germany, so we’re not sure which she’ll go for…. Mother and daughter were supposed to go to a milonga in Catania later that night but not surprisingly they fell asleep when they got home and missed it – much to Giulia’s chagrin, as there’s a tradition in Tango circles where those celebrating a birthday take to the floor for one track of music and get danced off their feet by a succession of ‘excuse-me’ partners. On Monday we’d been invited to meet the man, at the Town Hall, in charge of waste disposal (this is the on-going ‘rubbish in the ravine’ saga). This morning he is all smiles and listens to my suggestions of putting up warning signs either end of the road leading to the bridge, from which people continue to dump tyres, ‘fresh’ horses heads – presumably from an un-registered butcher’s – and all types of household rubbish – not to mention whole cars! – I suggest signs with wording to include heavy fines, area under video surveillance etc, as a scare tactic before they’ve even put CCTV cameras in place. He nods approvingly and searches for suitable signage on the internet and even types a mock-up of a possible sign BUT, somehow it just feels like a sop…He could make it happen but equally it could just remain an idea…. yet more words with no action. I leave his office with such a deep feeling of dissatisfaction and frustration that before leaving the building, I call the Consigliere. There’s no answer, so I begin texting in my schoolboy Italian. I’m about to send it when I see him walking down the corridor towards me waving his phone flagging up my missed call. I pour out my story of frustration but his reply comes with the now familiar Sicilian shoulder shrug ‘It’s with him now, he’s the head of that department, there’s nothing I can do’ ‘But’ I counter ‘You have the ear of the vice-mayor and indeed the mayor himself. You could pressure the man behind his desk via them’ ‘Hmm, I’ll try’ he says. His ears do prick up though when he hears my suggestion of a plain-clothes police trap raising funds for the clear-up through the ensuing fines. Well, at least my spirits are somewhat lifted as I leave the building and head for the hardware shop. There I’m happy to report, I find exactly what I’m looking for i.e. the correct stoppers for the assortment of 5 and 10 litre glass bottles full of the most delicious organic olive oil we’d bought from Susan and Ciccio in Noto the week before. My next mission is to find collars and bells for Ruth and Frank and having worked through the list of hardware and ‘everything for animals’ shops, I’m directed to Santa Venerina’s only Antique emporium. I come away with 2 rustic bells befitting our diminutive Tibetans – one from Switzerland, the other from Lourdes! Now, how to ‘fit’ them? Frank’s easy – tempted by food, would you believe? Ruth, on the other hand, takes a smothering rugby tackle in the confines of their own box. I improvise the collars with some spare nylon tape, just the right width not to chafe their wee necks and release them. Their sight and sound bring a large appreciative smile to Rosi’s face. That night, however, neither of us appreciate the full hour it takes to get them back into their honeymoon suite! The following day I get them used to coming to the rattle of a tub-ful of sunflower seeds, so that when it comes to locking them up for the night it proves a lot easier. On a totally different tack, I am very much hoping the replacement part for the chimney gets here soon (damaged some time ago by low branches, which I have since cut back) – while most days are warm, the temperature drops dramatically after sun-down and I’m really missing the cosiness of our wood-burning stove – one lit gas ring and a hot water bottle at both ends, really don’t cut it…especially when Ruth’s away teaching. But Hey Ho (my favourite Kurt Vonnegut expression) she’ll be back home again soon……. 16th Fire at the Ravine! One day when I’ve just snuggled into bed for a lunchtime nap, my eye catches sight of a huge column of black smoke not far away, in the direction of the ravine. Frank goes to explore and after half an hour comes back with the news: someone has dumped some more rubbish and then had the dumb idea to set fire to it! By the time Frank arrives, the fire is unattended and part burned down but one sees by the scorched oak tree next to it just how high the flames must have been. Frank removes a few things, such as some already burning tyres, and takes some photos. Luckily the arsonist chose the top end of the fly-tip. If he’d started a fire in the bottom, this would have been a terrible environmental disaster, as it is near on impossible to extinguish several hundred burning tyres. We immediately ring the council. We get to speak to Scuderi who asks ‘who lit the fire?’ As if we knew! The lethargy in these matters is astounding, and the type of questions directed at us leaves us speechless! We don’t even know if they bothered to send the police or the fire brigade after our phone call. The next day we go to the council to deliver the photos. Again, several people ask who lit the fire and tell us that they shouldn’t do this and that it is dangerous. You don’t say! We impress on them how lucky they were that ‘only’ the top end burnt down. Again, nothing, NOTHING moves in the next days. This is a major disaster waiting to happen and nobody moves. Even if they don’t have the finance to clean up just yet, they could be putting up signs, they could put the location under surveillance, be it via cameras or police attendance. More tyres and horse cadavers arrive on a weekly basis. How bad does it need to get until they wake up? We are starting to lose hope that anything will ever happen. If you want to see more pictures, go to our flikr album, but be warned that there are some pretty disturbing images, especially if you are a horse lover! After our excursion westwards, we drop in on Luca and Laura for a day of work on the farm and some horse riding, and then we return to our lovely Passopomo via Catania Airport to pick up Adele and her daughter Maya who have come to visit us all the way from England. We’ve been on the road for 18 months and have repeatedly invited friends and family, but these two are the first ones who have braved the distance and the uncertainty of where we might be, where they might stay etc. Maya is a keen rider, so we design our outings around riding times at the Maneggio. One morning, we drive up to the lava fields of Mount Etna and scramble around on them like goats. 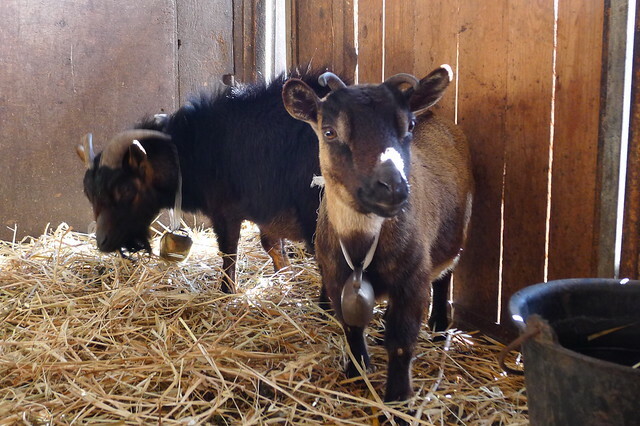 Talking of goats, Frank and Ruth have settled into their new home in Passopomo and are now able to roam freely while Rosi is there working with the horses. The tables have turned, and instead of being afraid of the dogs, the dogs are now afraid of the goats! Ruth has found out that she can chase Pongo and she’s successfully head-butted Nerino who, as a result, is now completely disinterested in them. However, when all five of the dogs have designs on them, it´s time to shepherd them back to the safety of their current pen (an empty horse-box). 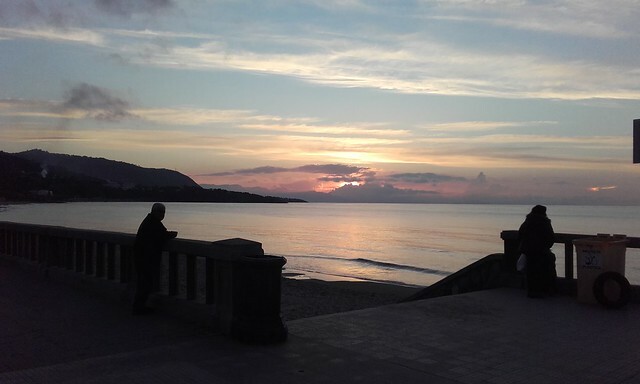 After three days, we change location and take our visitors to Luca’s place near Cassibile, where the riding continues. Adele has rented a car, so we are also free to visit places that we haven’t been able to access with our Emma. We spend a lovely, sunny day descending to the lakes in the beautiful Cassibile gorge, even taking a swim in the cold, cold water, taking photos of goats and picking wild Carob pods – sustenance for the precipitous climb back to where we parked the car. It is lovely to be able to share all these beautiful places with our friends from home, it makes a connection between our lives here and there. 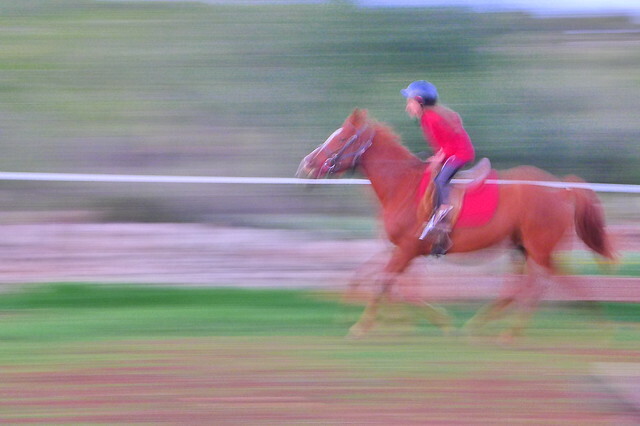 It is great to see Maya improving her riding daily, working up to a canter that is too fast for a photo! Adele is a more cautious rider, but the lessons are tailored to each person´s level and need. 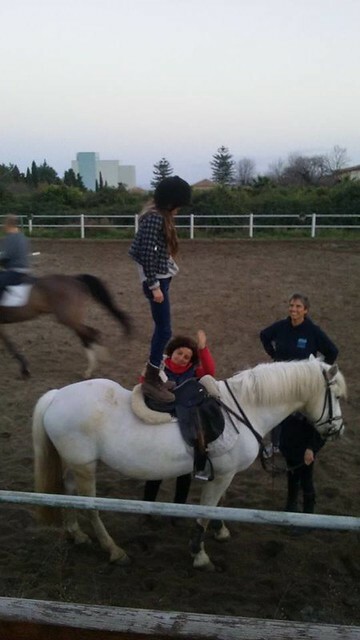 At the end of the day, there’s a session of Equestrian Vaulting, starting from changing the way you face on the horse, ending with standing on the horse´s back. We also go back to our lovely beach at Fontane Bianche, pleased to see that it is still clean and the sign is still in place. 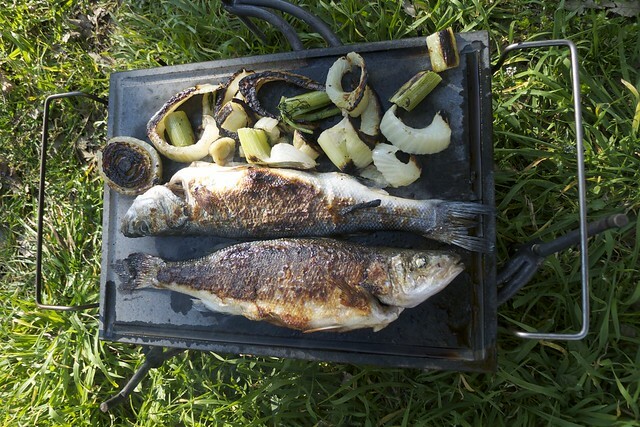 We have a lovely BBQ with fresh fish and a dip in the sea.